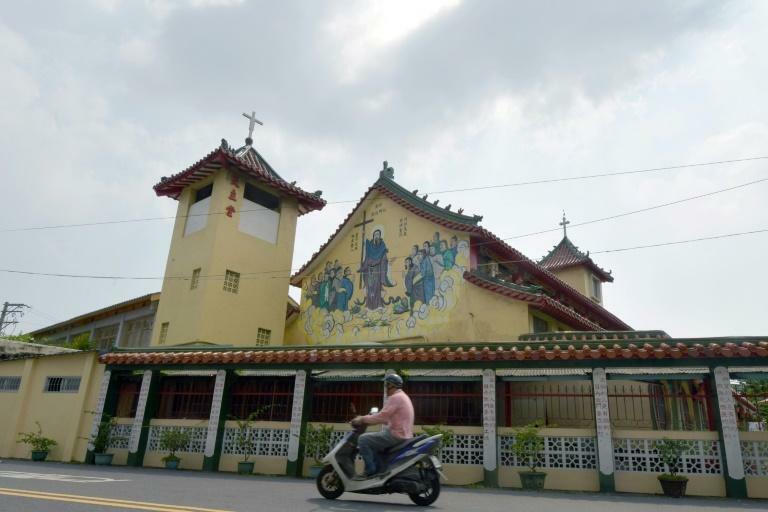 With a cross rising from a red pagoda roof and two lion statues guarding the entrance, a Catholic church in southern Taiwan could easily be mistaken for one of the ubiquitous temples dotting the island. 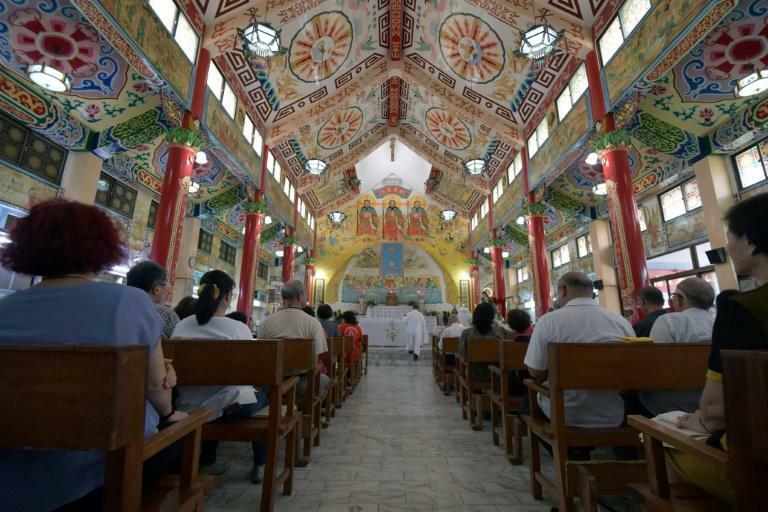 Taiwan embraces freedom of religion and has one of the highest densities of temples in the world, with close to 70 percent of the population believers in Taoism, Buddhism, and Chinese folk traditions. About six percent of Taiwan's 23.57 million population are Christian, with 300,000 of those Catholic. There are more than 1,000 churches across the island but the Holy Spirit Church is particularly unique. Located on a quiet road in the rural town of Yanshui, about an hour's drive from southern Tainan city, it started life as a simple wooden structure, built by a German missionary more than six decades ago. However, in 1986 it was reconstructed by Chinese pastor Li Shaofeng who had a very different vision, melding features of a typical Chinese temple into the design, including lanterns, red pillars, and painted dragons motifs. "The pastor thought of building a more Chinese-style church to adapt to the local environment," said Joseph Chung, the church's current pastor. "He built this church hoping to attract more followers," said Chung, 67. Several other churches in Taiwan incorporate some temple-like characteristics, but none to the same extent. Murals cover almost all of the interior walls of the Holy Spirit Church, depicting teachings from the Bible, but with a twist -- most of the figures look Asian and wear Chinese-style clothing. Even the bread in the church's mural of "The Last Supper" -- the famous Leonardo da Vinci painting of Jesus and his apostles -- is replaced with baozi, Chinese steamed buns. 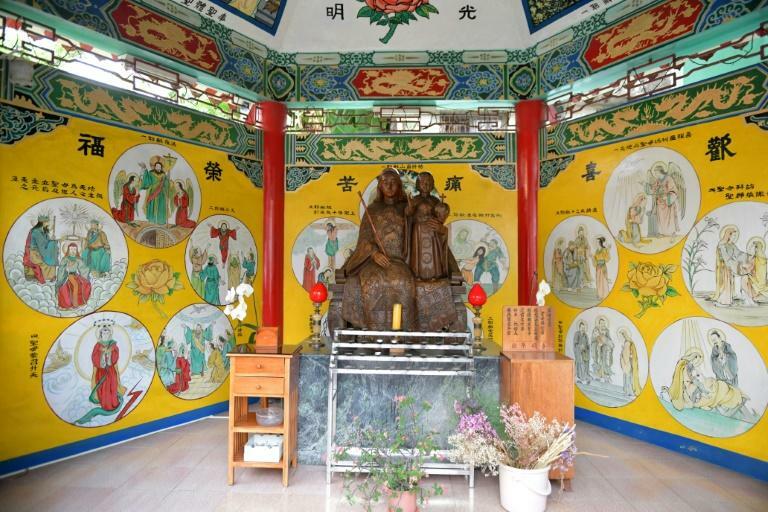 At the back of the main hall, next to the confessional, is a shrine with candles and a Chinese incense bowl to commemorate the church's late pastors. Burning incense is a common Chinese tribute to deities or ancestors. Chung says the number of regular followers attending services has dropped in recent years as Yanshui residents move to bigger cities. But masses are still held daily, with special events drawing believers from all over southern Taiwan. Churchgoer Cecilia Huang has been a regular visitor to the Holy Spirit Church for 20 years and says she particularly likes praying with the nuns. Huang says she appreciates the church's design aesthetic and says it does not change the nature of her religion. "The essence is the same," said Huang, 66. "It's only the appearance that looks like it's integrated into Taiwan's environment, bringing blessings to this place."